The aim this program is to enhance the natural musical talent that children have and, at the same time, to help them to acquire music literacy regardless whether the child is formally studying an instrument or not. From age 3.5 (*) Stringnote offers the Talent Development Programme, a course that includes singing and ear training, plus the introduction of individual piano from age 4. (*) Please note that all ages are approximate, as they may vary according to the speed of development that every child particularly has. 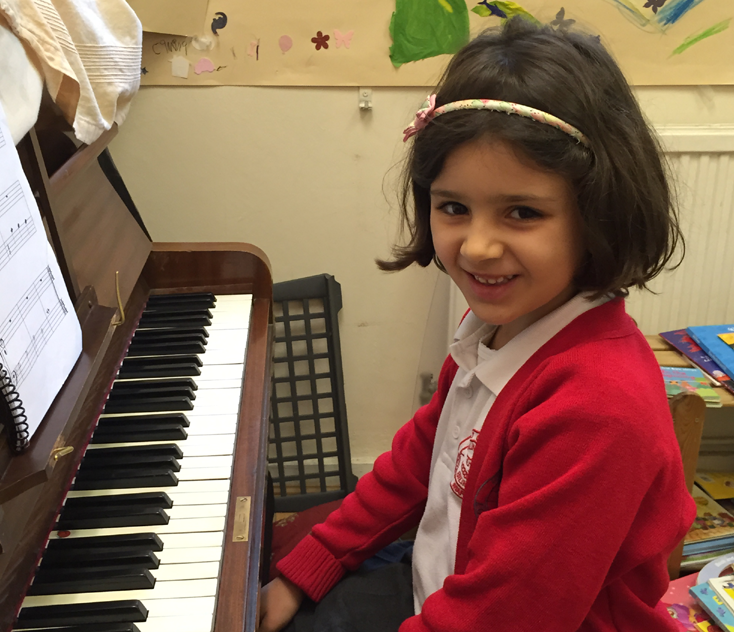 Our music sessions are an excellent introduction to a more structured learning of music and each session has two parts: a) the learning of pre-grades piano (minigrades) and b) the development of musical activities, including singing, aimed to develop temporal-spatial coordination, which is a key element for broader mathematical and language skills. Rhythmic skills: by playing percussion instruments and learning to read rhythms in traditional music notation. Melodic skills: through sight-singing and other activities, including improvisation on a keyboard. Chord production and basic harmony perception. Above all, children will enjoy a relaxed atmosphere and the opportunity to develop their musicality and natural creativity. Free Taster Lessons are available! To know more about our Free Taster Lessons please click here. To start with piano, children should be at least 4 years old. If your child is age 3.5, he/she can join only for the group exercises -rhythmic and melodic development- to start with piano at age 4 once other criteria is met. For more details about our programme please do contact us on 07946 808976 or click below and we’ll contact you with the information you need.